Thereafter fast forwards to what's left after the end, post apocalypse as we continue to survive, like cockroaches. I'll be hiding out, avoiding people (because that's probably safest! ), surviving off the land. The current bounty on the menu is raven, regular and extra large, and it wouldn't do to waste what's left, so I'll wear it. Who says you can't be stylish at the end of the world? The Corax mask works best with non fluffy hat friendly hair, as it is helmet like all the way around the back. 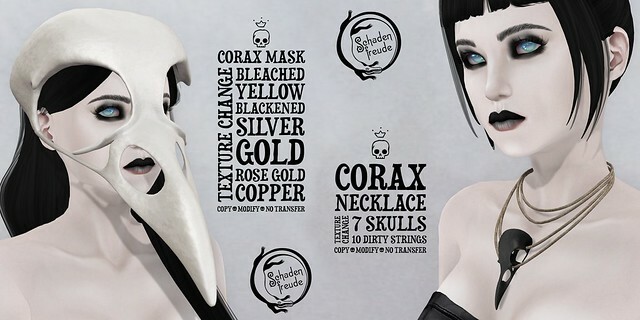 Both necklace and mask have 7 skull options (4 metals, 2 bones, and a blackened), and the necklace has a selection of dirty string textures in a few colours (neutrals and a couple of colours). The necklace can also be changed with the HUD from String Things for more shiny/bright/pretty options. Get your survival kit for the apocalypse at Thereafter!